HAVANA — The scene at Havana's Victor Hugo Park is unfortunately typical, with a handful of boys kicking a soccer ball through trees while dozens of gray-haired seniors bend and stretch to the urgings of a government-employed trainer. So few children, so many elderly. It's a central dilemma for a nation whose population is the oldest in Latin America, and getting older. The labor force soon will be shrinking as health costs soar, just when President Raul Castro's government is struggling to implement reforms that aim to resuscitate an economy long on life support. "We must be perfectly clear that the aging of the populace no longer has a solution," Castro's economic czar, Marino Murillo, told lawmakers in an alarmed tone last month. "It is going to happen, and that cannot be changed in the short term. ... Society must prepare itself." The aging of Cuba's population has its roots in some of the core achievements of Fidel Castro's revolution, including a universal health care system that has increased life expectancy from 69 years during the 1960s to 78 today, comparable with the United States. Abortions are free and it is estimated that half of Cuban pregnancies are terminated. High university graduation rates, generally associated worldwide with low fertility numbers, have Cuban women averaging 1.5 children, below the rate of replacement. Cuba's National Office of Statistics says about 2 million of the island's 11 million inhabitants, or 17 percent, were over 60 years old last year. That's already high compared to Latin America as a whole, where the rate is somewhere north of 9 percent, extrapolating from U.N. figures from 2000. That U.N. study shows Cuba's population is aging even faster than that of China, which has forbidden couples to have more than one child. Cuba's rate would be typical in a wealthy European nation. But Cuba lacks the wealth to cope with it. The trend is accelerating, with the number of seniors projected to nearly double to 3.6 million, or a third of the population, by 2035. During the same period, working-age Cubans are expected to decline from 65 percent to 52 percent. The future may look a lot like Emelia Moreno. Still vigorous at 75 years old, she lives alone in a small apartment in Central Havana and spends much of her time at a neighborhood senior center that provides 1,000 retirees with medical attention, meals and social activities such as singing and dance classes. "Cuba is fighting so that people of a certain age don't feel too bad," she said. But her only child left for the U.S. a decade ago, and she knows that one day she'll be completely dependent on the government because she has no family to take care of her when she cannot. "I had heard people talk about how they felt empty when a family member left, but I had no idea," Moreno said, caressing a photo of her daughter, Yeniset. The graying trend can be traced partly to the country's weak economy, resulting in the loss of people such as Yeniset, an outflow of 35,000 per year as people seek opportunity in the United States and elsewhere. Research shows emigrants are increasingly women of child-bearing age, which compounds the problem, according to Alberta Duran, who was among the first to examine the aging trend before retiring from her post at a Cuban sociological research institute. "The aging population has been turning into Cuba's biggest demographic problem since the 1990s," Duran said. By 2021, more Cubans will be leaving the workforce than entering, according to government projections. The contracting labor pool presents a challenge for Cuba's goal of making the country more productive and efficient without abandoning its policy of providing for everyone's basic needs. Officials aim to eliminate 1 million redundant government jobs and grow a non-state sector that, it is hoped, will account for 40 percent of economic activity compared with about 15 percent today. "Reform becomes more difficult due to emigration," said Sergio Diaz-Briquets, a Washington-based expert on Cuban demographics. "Those who leave are the youngest, best-educated and most ambitious." And with the ranks of seniors increasing, Diaz-Briquets said, resources that could be used to stimulate the economic project inevitably will have to be diverted to care for the elderly. Demographers agree that Cuba's population has topped out around 11.2 million, and negative growth will be the rule for the forseeable future. Murillo, the economic czar, said authorities are studying measures for next year to try to stimulate fertility rates, but he did not give details. "We are going to have a serious problem with the availability of a labor force," Murillo acknowledged. 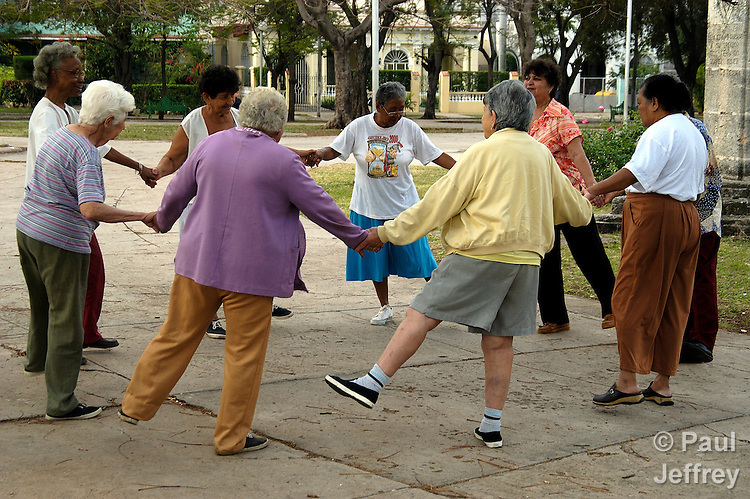 In recent years Cuba has implemented a number of measures for the aging, including an expanded denture distribution program and establishing "grandparents' circles" of elderly citizens who get together for activities and help each other out when the relatives they live with are at work. Authorities recently asked seniors to keep active later in life by rolling the retirement age progressively back from 55 to 60 for women and from 60 to 65 for men. Raul Castro himself is already 16 years past his golden-watch moment, at 81. Cuba recently allowed retirees to return to work and still collect their pensions. They're also being encouraged to join the class of small-business owners setting up shop under Castro's reforms, though experts say that idea has limited potential. Aging populations present difficulties for countries around the world, and attempts to spur birth rates have produced meager returns, Diaz-Briquets said. But he suggested that if Castro's reforms can create more opportunities for private enterprise, Cuba might be able to woo immigrants from countries where extreme poverty is rampant and homicides are skyrocketing, places where the Communist-run island's free health care and relative public safety might seem a good alternative. "The situation in Haiti and some Central American nations will continue to be even worse than in Cuba," Diaz-Briquets said, adding that a post-U.S.-embargo Cuba could be even more attractive to potential migrants from those countries. "The way things are going, and assuming some more positive scenarios for Cuba, the idea doesn't seem that outlandish."